A Virtual Private Network, or VPN, creates an encrypted tunnel between you computer (client) and the VPN (server). This encrypted tunnel carries data that cannot be deciphered without the proper keys, and you control what clients have access to those keys. A popular VPN software is called OpenVPN. This software uses strong encryption methods to help ensure that no spying eyes can see what you are doing. I cannot guarantee that this software will keep you completely anonymous, but it is an excellent start. VPNs have many other uses besides Internet anonymity; they can connect a user to a local area network even if they are not anywhere near it. If you need to access a file at a business from your home, a VPN is probably used. The objective of this guide is to explain how to configure OpenVPN on a server and client to form a strong encrypted VPN tunnel. This guide helped me configure my connection. If you run into any trouble in this tutorial, take a look at this guide or leave a comment below. These are the things you will need in order to successfully create a VPN. An Ubuntu Linux Server. If you do not have a Linux Server, refer to my cloud guide for more information on how to set one up. Port forwarding skills. If you do not know how to port forward on a router, check out Step 7 of my cloud guide for specific instructions. A domain name attached to your server. If you do not have a domain name for your server, refer to Step 9 of the cloud guide for instructions. If you have not already noticed, my cloud guide is a great reference point for basic information regarding server setup. I walk though the entire server setup in that guide. Please do not hesitate to ask questions! It is very important that you follow this guide to the letter. One mis-configured setting can throw off the entire configuration. This will install the openvpn client on our server. Note Ubuntu will ask your password. Type in the password that you created when you installed Ubuntu on the system. Do not worry that no asterisks are showing up when you are typing your password, its supposed to work that way! This command will allow you to edit the interfaces file of the server. The file should have two lines in it. If your file has more lines in it, be sure to comment those out with a hashtag (#). I have added my comments in the example file below. Please remember to change the fields according to your specific network requirements. Make sure that you do not copy the first two lines of this code if you already have them in your file. Copy and paste the following code into the file. Once you have finished, press Control + O and Enter to save changes, and then Control + X to exit. # The next two lines are the original lines of the file, leave them in here. #The IP Address above needs to be the IP address of your server. #The netmask will probably not need to be changed. #The gateway column refers to the default gateaway of your router. #still need to be here. Step 4: More Configuration and Forwarding! Uncomment the line that says net.ipv4.ip_forward=1. To uncomment a line, simply remove the hashtag (#) at the beginning of the line. Next, we need to forward port 1194 to the IP address of our server. Please see Step 7 of my cloud guide for more information on how to port forward. If you get a response, you are good to go! The certificates we will create in this step allow our server to authorize clients trying to access the VPN. This is the configuration file used to create authorization certificates. Next, change the following fields at the bottom of your file to you liking. There are two e-mail lines, but you only need to edit the first one. Make sure you have quotation marks around each of the values. Once you are finished editing the values, press Control + O and then enter to save the changes, and Control + X to exit back into terminal. We are now ready to generate certificates for the server. The server keys and certificates are now created. Next, we need to make the client keys and certificates. Replace the word client with whatever name you are assigning to the client device. In my example, I assign the name ubuntu to my client device. Be sure to change both instances of the word client to your specific client name. Transfer the following files from the server to the client device. If Ubuntu does not let you copy the files. Try pressing Alt+f2 and entering gksudo +nautilus. Then you will be copying the files as root. Please note that the first two files have different directories than the last two. Transfer the files to the client device using some form of physical storage. Do not transfer the files over the Internet in a non-secure fashion such as e-mailing them to yourself. Later in this Instructable, I will show you where to place those files on the client device. Once finished press Control + O to save changes and Control + X to exit. This is a very confusing part for most people, so this is a very important step. We are going to configure the proper settings for the VPN server. There are many different things we have to change in this configuration file. In the file, a semicolon at the beginning of a line means that the line is commented out, meaning it does not apply. To uncomment a line, simply remove the semicolon and the line will become active. I will demonstrate this with as many pictures as I can. Please look at those pictures for the proper configurations if you do not understand the text. I am just going to tell you what to do in the text, so the pictures are extremely important. Comment out the dev tun line. Uncomment the ;server-bridge 10.8.0.4 255.255.255.0 10.8.0.50 10.8.0.100 line. The first IP address is the local address of the server. The second set of numbers is the subnet mask, match it to your IP address. In most cases this value will not need to be changed, The third set of numbers is the beginning range IP address you would like to assign to devices that connect to your VPN. The fourth set of numbers is the ending range IP address you assign to client VPN devices. When a device connects to the VPN, it will be assigned a local IP address defined in the final two sets of numbers in this line. It is important that you do not assign IP addresses in this file that are already in use by other devices on the local network. Uncomment the ;push "route 192.168.101.1 255.255.255.0" line. Change the IP address to match that of your default gateway. In my example it is: 192.168.2.1. Uncomment the ;push "redirect-gateway def1 bypass-dhcp" line. Uncomment the ;push "dhcp-option DNS 208.67.222.222" and ;push "dhcp-option DNS 208.67.220.220" lines. If you would like to point the point the server to your own DNS servers, change the DNS server IP addresses. If not, you can leave this addresses alone as they are OpenVPN's DNS Servers. Uncomment the ;tls-auth ta.key 0 # This file is secret line. Uncomment the ;cipher AES-128-CBC line. Reboot your server to restart all networking equipment. This completes the VPN server configuration, now we need to configure our client. This step will explain how to install and configure the OpenVPN client on Ubuntu Linux. If you are using Windows, I have created a configuration guide in the next step. I would head over there now. Copy the certificates from Step 6 into the home directory. Open the network manager by clicking System Settings > Network. Press the + button at the bottom of the page and create a VPN Interface. Choose OpenVPN as the connection type and click Create. Name your VPN in the Connection Name field. Enter the server's domain name you registered earlier in the gateway field. Open your client.crt file in the user certificate field. Open the ca.crt file in the CA Certificate field. Open the client.key file in the Private Key field. From the drop-down list in the cipher field, select AES-128-CBC. Check the Use additional TLS authentication checkbox. Uncheck the All users may connect to this network checkbox. Click Save to save your VPN settings. Turn the VPN connection on and you should be good to connect to your VPN. Now I will show the Windows users how to configure OpenVPN on the client PC. First, visit this link and download the OpenVPN client for your version of Windows. Next, open My Computer and click on your C: drive. Navigate to Program Files> OpenVPN>sample-config. If you are using Windows Vista/7/8, open My Computer as administrator. Go back one directory and click the config folder. Paste the client file in this directory. Also, paste the files you copied from the server earlier in this guide into this folder. Open the client.ovpn file with notepad. Edit the following lines just like in the server.conf file. Uncomment the dev tap line and add a 0 to the end. The line should now say 'dev tap0'. In the remote server line, enter the domain name of your server. Do not remove the remote word or the 1194. See the picture for clarification. Please see my picture for further clarification on this step. Uncomment the tls-auth ta.key 1 line. There should be a OpenVPN GUI icon on your desktop. Open this program. If you are using Windows Vista/7/8 open this program as administrator. The program will load the configuration file. To connect to your VPN, find the icon in the system tray. Right click it and click connect. The program should now connect you to your VPN server. Great tutorial, right now i don't have much time to configure this in our 50 machines but i did it at home and it worked great. Btw do you think i should just buy a subscription from some mainstream vpn service https://vpntrends.com/best-vpn-services to save me the time of installing this in all our computers at work? I don't think it's feasible to host a VPN server for 50 machines. You might want to consider a VPN appliance (Cisco comes to mind) and a commercial VPN service. Does it have a user limit, like using OpenVPN Access Server? HI, pls I am really knew with all this stuff but really want to try hosting my own vpn. pls is there any way this configuration can be done on a virtual machine hosted on my main laptop. I got as far as step 4 and thought that i'd finished, but when I ping the server IP all i get is "Request timed out.". Can you please suggest where I went wrong? Thanks! I want to setup a cloud on Linux Mint that is only accessible at home. I don't need it to be accessible over the net. We use iOSX, windows and Linux on the tv streaming computer. Is this an easy setup? How do I do this? Do you have any update on how to tunnel IPv6? I have gone through all of the instructions exactly as described, but ran in to a couple of problems. What do I need to do to fix these problems? 1) After I update the /etc/network/interfaces file, the server is no longer able to connect to the router and/or Internet. 2) Error messages appear when generating client keys. Able to pin the router connect to the Internet (to install things); Other devices can access server by going to ServerIP:Port via web browser. Unable to ping the router and/or Internet; Other devices cannot connect either. Novice. Your Cloud 2.0 was easy to follow. I am running into the same issue when I come to Housekeeping as below and nothing posted here or by searching internet has resolved it. I am getting the could not resolve messages for us.archive.ubuntu.com. Easy-rsa does not install so I cannot move the certificates. What am I doing wrong? What I noticed is that after installing OpenVPN on Ubuntu Server 14.04 that when you run the command "sudo mkdir /etc/openvpn/easy-rsa/" it comes back as the directory doesn't exist. Then if you run "sudo mkdir /etc/openvpn/" it creates the directory which therefore means OpenVPN wasn't really installed. So when you try to run the command "sudo cp -R /usr/share/doc/openvpn/examples/easy-rsa/2.0/* /etc/openvpn/easy-rsa/" it can't execute because the directory was never create by the install. I get this error if I let the OS install OpenVPN when I install the OS or when i manually install OpenVPN by executing the command "sudo apt-get install openvpn bridge-utils". 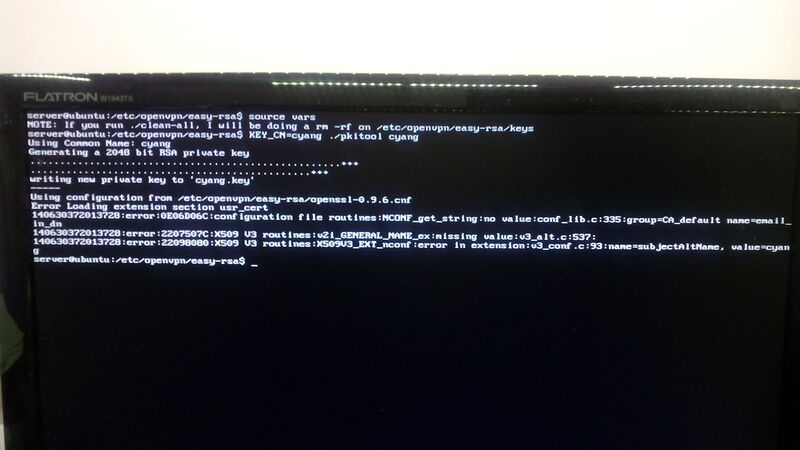 Maybe it has something to do with the fact that we are trying to do this on the actually Ubuntu Server OS (14.10) and not on the Ubuntu Desktop OS like in the screen shots? So i'm not sure what is going on or how to fix it. Maybe download the files, put them on a usb stick and install them locally? I would have to try and research the commands to do so.